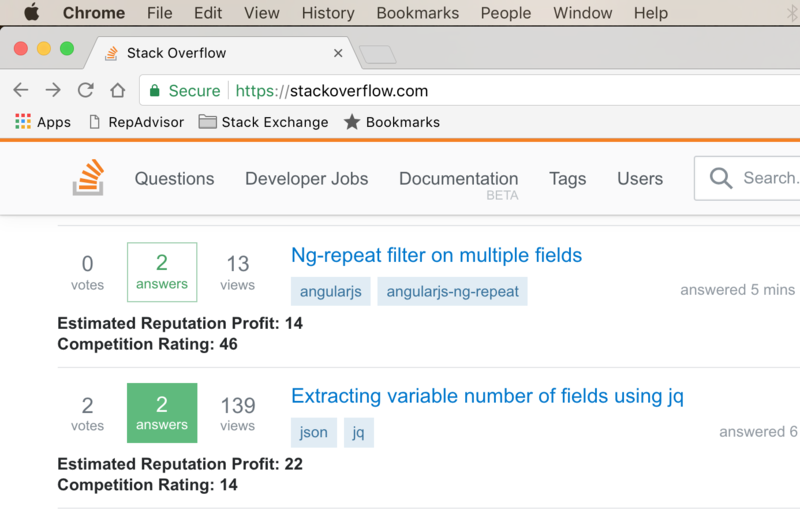 Almost all of us Stack Overflow users want to earn more reputation. However, we don't have all the time in the world to answer questions. RepAdvisor is a bookmarklet that predicts how much reputation you'll gain from answering any particular question, and calculates how hard the competition is. Add a new bookmark in your browser, and copy and paste the following code into the URL field. Save the bookmarklet in the bookmarks bar. Now, whenever you visit a Stack Overflow "browse questions" page, just click on the bookmarklet and RepAdvisor will run! Estimated Reputation Profit is a rough estimate of how much reputation you'll get by answering a question, given that your answer succeeds. Competition Rating is a score from 0-100 (higher is better) that shows how hard it is to get your answer to the top. With RepAdvisor, you just have to click on the bookmarklet, and you'll be able to see at a glance if answering some questions is a good deal. I used the Stack Exchange Data Explorer to collect data from a random sample of answered questions. I used a program to analyze and calculate the correlation between answer scores and question metadata. It's not a very strong correlation, but it should give a rough estimate. I calculated linear regressions for the data and put it into RepAdvisor's code as functions. In goes the question metadata, and out comes a prediction of how much reputation you'll earn if you answer it and how hard the competition is with other answers. Fastest Gun In The West Score: the script will calculate the "time remaining" in seconds to be the first person to answer the question. Personalized Reputation Formulas: the script will look into users' answers and use their answering history to modify how it calculates the "estimated reputation profit." For example, if a user has a history of good-quality answers, RepAdvisor will predict higher reputation profits. Edit Rep Farm Detection: the script will scan the body text of questions to look for spelling errors. It will display messages so users will know if they can quickly farm +2 reputation through editing. If you experience any bugs, feel free to report it in the comments below. Thanks for checking out RepAdvisor! RepAdvisor also works as a UserScript. Browse other questions tagged script api-v2.2 stackoverflow bookmarklet .